In order that a picnic should prove the unqualified success it should be, more than a fine day and pleasant company - both highly important items - are required. Forethought must be exercised by the hostess in regard to the countless small details which go to make up the comfort of her guests. Leave nothing to chance. If a river picnic be in question, and the party be going down from town, write a couple of days beforehand to the traffic manager, asking to have a carriage reserved for your party by whichever train you propose to travel, not forgetting to mention the class. Write also to engage the necessary boat or boats - weather permitting - from a reliable waterman, who will have soda-water and stone ginger-beer in readiness to stow aboard, if asked to do so, besides good-naturedly providing bottles of drinking water for making tea. The cost of boat hire is from about 7s. 6d. to 8s. 6d. 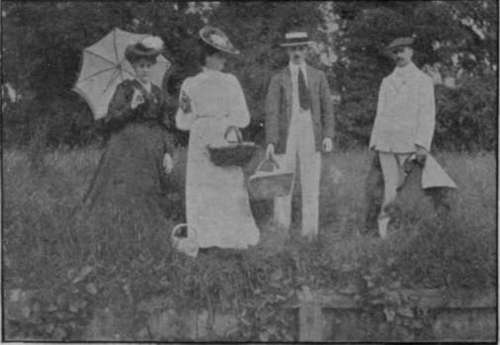 a day, at ordinary times - it varies slightly at different places; but for Henley Regatta, the great social picnic of the year, the prices range from two to three guineas for a single day's hire of a punt. It is hardly too much to say that at least half the success of a picnic depends upon the pro-v id i ng of daintily packed and appetising looking fare, be it as elabo-rate or as simple as you please; and the invention of cardboard plates and dishes has greatly simplified picnicking, for they cost only sixpence a dozen and are strong enough to allow of cold chicken and salad or cold meat pie being partaken of upon them. The weight is practically nothing, and they take up very little space to pack. It is, moreover, only necessary to take one plate for each person, no matter how many courses may have been provided, for the plates, when bought, are each filled with a circle of grease-proof paper, and to cut any number of extra circles from a quire of grease-proof paper, with the help of a big pair of scissors, is an extremely simple matter, and the picnicker, armed with a single plate and half a dozen papers, may par-take of salmon mayonnaise, chicken and salad, or meat pie, tartlets, fruit salad, or strawberries and cream in succession, wrapping up the remains of one course in the paper plate-cover, and putting it in the rubbish heap, and re-covering her plate with a fresh paper before going on to the next course. Charming fluted cardboard dishes for fruit, salad, and cakes are obtainable also, while smaller plates with a pretty blue-and-white border may be had for tea. Pies and tarts baked in white enamelled tin dishes travel beautifully, and salad, having been well washed and shaken in a cloth, and then placed in a white damask table-napkin, will arrive crisp and fresh. Butter keeps best if packed in a white china jam-pot, tied down with grease-proof paper, and cream travels well if ordered in a patent stoppered bottle from the dairy, and wrapped in green leaves to keep it cool. Jam tartlets make a delicious and much appreciated picnic sweet, and are easily packed if the pastry cases, when baked, are piled one on top of the other like saucers in a biscuit tin, and a small pot of jam taken separately to fill them on the spot. A couple of dozen cases will go easily into quite a small tin packed in this way, with a little tissue paper to prevent them from shaking about if the tin is jolted. A plain lunch cake or gingerbread cake is always much appreciated. Both brown and white bread, wrapped in a white cloth to keep it fresh, should be taken, allowing a loaf to every three guests for luncheon or supper, for people often develop astounding picnic appetites. Fruit salad travels well in a big jam-jar tightly tied down, or, better still, fitted with a screw top, and extra juice can be taken, if liked, in a separate well-corked bottle, and clearly labelled. If salmon mayonnaise is taken, have the fish boiled, boned, and skinned, and wrapped first in oil-proof paper, and then in dry cabbage-leaves, and rolled up in a white table napkin. Carry the mayonnaise sauce in a screw-topped bottle with a good wide mouth, for, though it will pour in easily enough, it will probably be impossible to get it out after it has thickened. Drinks are a very important matter. Stone ginger-beer is always popular, and, if wine is to be taken, hock and claret are best, with plenty of soda-water to accompany them. Few people know that tumblers are to be had for a penny each at any penny bazaar, and are quite good enough for picnic purposes. Choose the shape which will half-fit inside one another, and allow a couple of extra glasses in case of accidents. For river picnics it is essential to have some sort of portable spirit-lamp and kettle for making tea, and a biscuit-tin in which to place them while boiling, to avoid all chance of setting light to the boat. 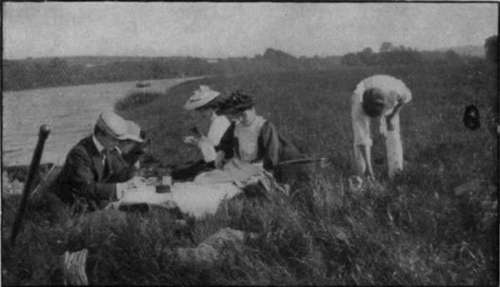 For a tea picnic always provide lettuces, a pot of jam, potted meat, and fruit, and very simple cakes. The tea should be measured out beforehand into squares of coarse-meshed butter muslin, which has previously been washed and dried, about five teaspoonfuls for each square is a good allowance, and the ends are then twisted up and tightly tied with cotton, allowing plenty of room for the tea to swell. When tea-time comes a bag of tea is dropped in the teapot, and boiling water poured on to it. This obviates the difficulty of making second brews of tea with a single teapot, for the bag can easily be taken out and thrown away, and a fresh one substituted.